Harry Potter and the Goblet of Fire is a 2005 British-American fantasy film directed by Mike Newell and distributed by Warner Bros. Pictures. It is based on the novel of the same name by J. K. Rowling. The film, which is the fourth instalment in the Harry Potter film series, was written by Steve Kloves and produced by David Heyman. The story follows Harry Potter's fourth year at Hogwarts as he is chosen by the Goblet of Fire to compete in the Triwizard Tournament. The film stars Daniel Radcliffe as Harry Potter alongside Rupert Grint and Emma Watson as Harry's best friends Ron Weasley and Hermione Granger. It is the sequel to Harry Potter and the Prisoner of Azkaban and is followed by Harry Potter and the Order of the Phoenix. Filming began in early 2004. The Hogwarts scenes were shot at the Leavesden Film Studios. Five days after its release, the film had grossed over US$102 million at the North American box office, which is the third-highest first-weekend tally for a Harry Potter film behind Harry Potter and the Deathly Hallows – Part 1 and Part 2. Goblet of Fire enjoyed an immensely successful run at the box office, earning just under $900 million worldwide, which made it the highest-grossing film of 2005 and the eighth-highest-grossing film of all time at that time. As of December 2015, it is the 37th highest-grossing film worldwide and the sixth-highest-grossing film in the Harry Potter series. The film was nominated for the Academy Award for Best Art Direction, and won the BAFTA Award for Best Production Design. Goblet of Fire was the second film in the series to be released in IMAX. The film is one of the best reviewed instalments within the series, being praised for the higher level of maturity and sophistication of its characters, plotline, writing, and performances of the lead actors. Harry Potter dreams of Frank Bryce, who is killed after overhearing Lord Voldemort discussing plans with Peter Pettigrew and another man. Harry attends the Quidditch World Cup with the Weasleys, but after the game Death Eaters terrorise the spectators, and the man who appeared in Harry's dream summons the Dark Mark. At Hogwarts, Albus Dumbledore introduces ex-Auror Alastor "Mad-Eye" Moody as the new Defence Against the Dark Arts teacher. He also announces that the school will host the legendary event known as Triwizard Tournament, in which three magical schools compete against each other in a very deadly competition by facing three dangerous challenges. The Goblet of Fire selects "champions" to take part in the competition: Cedric Diggory of Hufflepuff representing Hogwarts, Viktor Krum representing Durmstrang Institute, and Fleur Delacour representing Beauxbatons Academy of Magic. The Goblet unexpectedly also chooses a fourth champion: Harry Potter. Dumbfounded, Dumbledore is unable to pull the underage Harry out of the tournament, as the Ministry official Barty Crouch Sr. insists that the champions are bound by a contract, and therefore, Harry is invited to compete. This makes Harry's best friend Ron Weasley jealous of him. For the tournament's first task, the champions must each retrieve a golden egg guarded by a dragon. After summoning his broomstick, Harry succeeds in retrieving his egg, which contains information about the second challenge. Shortly after, another event known as the Yule Ball dance takes place; Harry's crush Cho Chang attends with Cedric, and Hermione Granger attends with Viktor, which makes Ron jealous of Viktor. During the second task, the champions must dive underwater to rescue their mates. Harry comes out in third place, but is placed second behind Cedric due to his "moral fiber". Afterwards, Harry finds the corpse of Barty Crouch Sr. Harry visits Dumbledore at his office, and while waiting for him, he discovers a Pensieve, which holds Dumbledore's memories. Inside it, Harry witnesses a trial in which Igor Karkaroff (Durmstrang Institute's Headmaster) confessed to the Ministry of Magic names of other Death Eaters, after Voldemort's defeat. He named Severus Snape as one, but Dumbledore defended him; he then named Barty Crouch Jr. This left Barty Crouch Sr. devastated, and his son was imprisoned in Azkaban. After exiting the Pensieve, Harry deduces that the man he has seen in his dreams with Voldemort is Barty Crouch Jr. In the third and final task, the champions enter a hedge maze and must reach the Triwizard Cup. Viktor, under the influence of the Imperius Curse, incapacitates Fleur. After Harry saves Cedric when the maze attacks him, the two claim a draw and together grab the cup, which turns out to be a Portkey and transports the two to a graveyard, where Pettigrew and Voldemort are waiting. Pettigrew kills Cedric with the Killing Curse and performs a ritual using a bone of Voldemort's father, Pettigrew's flesh and Harry's blood, which rejuvenates Voldemort, who then summons the Death Eaters. Voldemort releases Harry in order to beat him in a duel to prove he is the better wizard. Harry, unable to defend himself, tries the Expelliarmus charm at the same moment that Voldemort attempts the Killing Curse. Their wands do not work against each other, and Voldemort's wand is forced to disgorge the last spells it performed. This results in shadow impressions of the people he murdered appearing in the graveyard, including Harry's parents and Cedric. This provides an ample distraction to Voldemort and his Death Eaters, allowing Harry to escape with Cedric's body by grabbing the Portkey. Upon his return, Harry tells Dumbledore that Voldemort has returned and is responsible for Cedric's death. Moody takes a devastated Harry back to his room to interrogate him about Lord Voldemort, where he inadvertently blows his cover when he asks Harry whether there were "others" in the graveyard - despite Harry never having mentioned a graveyard. Exposed, Moody reveals that he had submitted Harry's name to the Goblet of Fire, and that he had been guiding and manipulating Harry throughout the tournament to ensure that he would win, so Voldemort would take Harry's blood in order to return. Moody then tries to kill Harry, only for Harry to be saved by Dumbledore, Severus Snape, and Minerva McGonagall. The teachers force Moody to drink Veritaserum, a truth-telling potion, which reveals that he is not Moody, and that the real Moody is imprisoned in a magical trunk. The false Moody's Polyjuice Potion wears off and he is revealed as Barty Crouch Jr., working for Voldemort. Crouch Jr. is sent back to Azkaban, from which he had escaped. In the morning, Dumbledore reveals to the students that Voldemort killed Cedric, although the Ministry of Magic opposes the revelation. Later, Dumbledore visits Harry in his dormitory, and apologizes to him for the dangers he had to go through. Harry reveals that he saw his parents in the graveyard; Dumbledore names this effect as "Priori Incantatem". Dumbledore acknowledges that even though Harry's parents appeared through Voldemort's wand, no spell can awaken the dead. Dumbledore reminds Harry that he is not alone. Soon after, Hogwarts, Durmstrang and Beauxbatons bid farewell to each other. Principal photography for Goblet of Fire began on 4 May 2004. Scenes involving the film's principal actors began filming on 25 June 2004 at England's Leavesden Studios. Steve Kloves, the screenwriter for the previous instalments, returned for Goblet of Fire. On adapting the 734-page book into a feature-length film, Kloves commented that "we always thought it would be two movies, but we could never figure out a way to break it in two. So it will be a different experience from the book." "Filming in an actual loch would have been too cold and impractical. We looked into doing a process called 'dry for wet,' where you suspend an actor and blow wind on them to give the illusion that they are underwater, but the hair didn't undulate convincingly." As in the previous instalments, Stuart Craig and Stephenie McMillan provided the film's art and set designs, respectively. Due to the film's scope, there were many new sets and transformations of old sets created. McMillan was most excited about redesigning the Great Hall for the scenes involving the Yule Ball. "Originally we thought silver curtains, silver table cloths and an ice dance floor," said McMillan, "but it just went on and on. The drapes man eventually said, 'Why not just stick the fabrics on the wall?'" Each task of the Triwizard Tournament required massive sets. The rock quarry set for the first task, where Harry faces off with the Hungarian Horntail, was built in two sections at Leavesden Studios. Craig called it "one of the biggest sets we've ever built for any of the films." For the second task, involving the film's underwater scenes, the film crew designed and built a blue screen tank holding "about half a million gallons of water." As for the final task, which took place in the maze, hedge walls ranging from 20 to 40 feet tall were constructed and enhanced with computer-generated imagery. John Williams, who had scored the first three Harry Potter films, could not return for the fourth instalment due to a busy 2005 schedule. Patrick Doyle, who had worked with Newell in Into the West and Donnie Brasco, replaced him as composer. The initial request was that Doyle would be working with Williams' material, but eventually only "Hedwig's Theme", the leitmotif of the series, remained from the previous scores. Pulp lead singer Jarvis Cocker, who was even rumoured to score the film, was one of the musicians invited by Doyle, with whom he had worked in the Great Expectations soundtrack, to write a song for a wizard rock band. Once Doyle chose Cocker's composition, he and other British musicians such as Jonny Greenwood and Phil Selway of Radiohead were picked to play the fictional band, both performing songs for the soundtrack and having cameo roles in the film. With the Goblet of Fire novel almost twice the length of Prisoner of Azkaban, the writers and producers reduced certain scenes and concepts to make the transition from page to screen. Director Mike Newell described the problem as one of "compressing a huge book into the compass of a movie". This was achieved by "putting aside" all the components of the novel which did not directly relate to Harry and his journey. Goblet of Fire is the first film adaptation not to begin at Privet Drive; after the opening sequence, Harry awakens at the Burrow on the morning of the Quidditch World Cup. The game play at the Quidditch World Cup was removed for timing reasons, leaving an abrupt temporal jump which some reviewers considered awkward or "rushed". In the book, Harry and many of the Weasleys supported Ireland, while in the film Harry and Ron supported Bulgaria. However, they also love Viktor Krum, from Bulgaria. Other scenes are shortened and amalgamated to include only the most essential plot details: the three Death Eater trials Harry witnesses in the Pensieve are merged into one sequence; the characters of Bill Weasley, Charlie Weasley, Ludo Bagman, Winky, Narcissa Malfoy and Bertha Jorkins are absent, as well as Dobby, who was supposed to help Harry obtain Gillyweed for the second task. Instead, that scene was changed to involve Neville Longbottom. There is no train scene at the end where Rita Skeeter is revealed to be an illegal, unregistered animagus; Harry is never seen either receiving or giving away the 1,000 galleons in prize winnings. All of Sirius Black's lines are condensed into a single fireside conversation. The scene in which Crouch Jr. is taken back to Azkaban is different from the book, in which he was "killed" by a Dementor summoned by Cornelius Fudge. There is also no conversation in which Fudge refuses to believe that Voldemort has returned, so this is explained in the next film. An exclusive first-look of the film was shown on ABC during the television premiere of Harry Potter and the Chamber of Secrets on 7 May 2005. The first trailer was made available online on 8 May 2005. The international trailer debuted online on 23 August 2005. The video game version, designed by EA UK, was released 8 November 2005. Mattel released a line of action figures and artefacts based on the film. Among these was the first edition of Harry Potter Scene It? containing over 1,000 questions involving the four films. Goblet of Fire was the first film in the series to receive a PG-13 rating by the MPAA for "sequences of fantasy violence and frightening images", M by the ACB and a 12A by the BBFC for its dark themes, fantasy violence, threat and frightening images. In the run up to the film, Warner Bros. approached a Canadian folk group called the Wyrd Sisters to obtain permission to use the name THE WEIRD SISTERS for its Harry Potter Band. When a deal could not be made, the Canadian band filed a US$40-million lawsuit against Warner Bros., the North American distributor of the film, as well as the members of the in-movie band (members of the bands Radiohead and Pulp, among others) for the misuse of their group's name. (In a deleted scene, they are simply introduced as "the band that needs no introduction".) The Canadian band also brought an injunction to stop the release of the film in its country as it contained a performance by the identically named fictional rock band. An Ontario judge dismissed this motion, and to avoid further controversy Warner Bros. rendered the band unnamed in the film and many derived products. However, the Winnipeg-based group continued to pursue the lawsuit; lead singer Kim Baryluk stated in her claim that "consumers will assume that the smaller and less famous Canadian band is trying to take advantage of the Harry Potter fame by copying the Harry Potter band's name when in fact the reverse is true." The injunction was dismissed, and the band was ordered to pay costs. As of March 2010, the lawsuit has been settled, the details sealed. Goblet of Fire was the second film in the series to be given a simultaneous release in conventional theatres and IMAX. Dubbed as Harry Potter and the Goblet of Fire: The IMAX Experience, the film was digitally remastered for IMAX from its 35mm form to take part in a "commercial growth strategy" set up between IMAX and Warner Bros. Pictures. The film was released in most countries within a two-week period starting on 18 November 2005 in the United Kingdom and United States, with a 1 December 2005 release in Australia. In the United States, the film opened in a maximum of 3,858 cinemas that included several IMAX screens. The world premiere of the film took place in London, England on 6 November 2005. One of the features of the premiere was an animatronic, fire-breathing Hungarian Horntail. The 40-foot-long dragon, used during the scene where Hagrid leads Harry into the forest a night before the first task, was designed and built by the film's special effects supervisor John Richardson and creature effects & makeup supervisor Nick Dudman. The film was released on DVD in North America on 7 March 2006. It was available in one- and two-disc editions, as well as part of an 8-disc box set that includes all four films made by that time. The bonus disc features three interactive games, as well as seven behind the scenes featurettes. The film was also released in UMD format for PSP. On its first day of release in North America, over 5 million copies were sold, recording a franchise high for first-day sales. Within its first week it sold over a total of 9 million units of combined sales of both the widescreen and full-screen versions of the DVD. The UK edition was released on DVD on 20 March 2006 and became the fastest selling UK DVD ever, selling six copies per second on its first day of release. According to the Official Charts Company, the DVD sold 1.4 million copies in its first week alone. It is also available in a two-disc edition with special features similar to the North American two-disc edition. Currently, the DVD holds the Guinness World Record for being the fastest selling DVD of all time. The achievement was added to the 2007 book edition of The Guinness World Records, which includes a picture of the award being presented to Dan Radcliffe on set of Order of the Phoenix at Leavesden Film Studios in April 2006. In the United States, the first five Harry Potter films were released on HD DVD and Blu-ray disc on 11 December 2007. The fourth film has since become available in numerous box sets containing the other films released in the series, including the Harry Potter: Complete 8-Film Collection and Harry Potter Wizard's Collection. An Ultimate Edition of Goblet of Fire was released on 19 October 2010, featuring behind-the-scenes footage, trailers, additional scenes, and a feature-length special Creating the World of Harry Potter Part 4: Sound & Music. Despite not being included in the Ultimate Edition, an extended version has been shown during certain television airings with a running time of about 167 minutes. After an opening day of $40m at the North American box office and staying at No. 1 for three weeks, The Goblet of Fire made a successful 20-week run in cinemas, closing on 6 April 2006. The film set numerous records, including the highest non-May opening weekend in the US, and earned £14.9m in its opening weekend in the UK, a record which has since been beaten by the 2008 James Bond film Quantum of Solace, which took in £15.4m. The Goblet of Fire drew $102.7 million its opening weekend at the North American box office, setting a new opening high for the franchise and also achieved the highest weekend debut in November, with the latter being surpassed by The Twilight Saga: New Moon in 2009. It sold about as many tickets as Harry Potter and the Philosopher's Stone did in its opening weekend. The film's franchise record was later overtaken in 2010 by Harry Potter and the Deathly Hallows – Part 1, which opened to $125 million; Harry Potter and the Deathly Hallows – Part 2 followed with $169.1 million in its opening weekend. The Goblet of Fire's debut marked the fourth $100 million weekend in history and as of July 2011, it stands as the 17th largest opening weekend ever. In Mainland China, the film generated 93 million yuan. The Goblet of Fire earned almost US$897 million worldwide, making it the highest-grossing international and worldwide release of 2005. In IMAX theatres only, the film grossed a total of US$20,033,758 worldwide for a cumulative per screen average of $188,998 thus setting a new record and a new milestone for a digitally remastered 2-D IMAX release. In January 2006, The Goblet of Fire surpassed the box office takings of Harry Potter and the Chamber of Secrets (2002) to become the eighth-highest-grossing film worldwide, and the second-highest-grossing film in the Harry Potter series, behind The Philosopher's Stone. As of July 2011, it has been the sixth-highest-grossing Harry Potter film behind The Philosopher's Stone, The Order of the Phoenix and The Half-Blood Prince, The Deathly Hallows – Part 1, and The Deathly Hallows – Part 2. The film ranks third in the North American box office behind Star Wars: Episode III – Revenge of the Sith and The Chronicles of Narnia: The Lion, the Witch and the Wardrobe for 2005, although both films rank lower than Harry Potter and the Goblet of Fire in worldwide terms. Harry Potter and the Goblet of Fire received critical acclaim . As of October 2012, the film holds an 88% "Certified Fresh" overall approval rating at Rotten Tomatoes. Likewise at Metacritic, the film received a score of 81, which indicates "universal acclaim". The New York Daily News praised the film for both its humour and its dark tone. The young actors were praised for demonstrating a "greater range of subtle emotions", particularly Daniel Radcliffe whom Variety described as delivering a "dimensional and nuanced performance". New cast members were also praised: Brendan Gleeson's portrayal of Mad-Eye Moody was described as "colourful"; Miranda Richardson's scenes as Rita Skeeter were described as "wonderful"; and Ralph Fiennes's portrayal of Lord Voldemort was described as "sublime villainy". The maturity of Harry, Ron, and Hermione, among others, impressed most critics. While the major characters were portrayed as children in the previous films, "they have subtly transitioned into teenagers (in Goblet of Fire)" according to one USA Today reviewer. Desson Thomson of the Washington Post called the film "Probably the most engaging film of the Potter series thus far". Joe Morgenstern of the Wall Street Journal stated "The studio, like plucky Harry, passes with flying colors. The new one, directed by Mike Newell from another astute script by Mr. Kloves, is even richer and fuller, as well as dramatically darker. It's downright scary how good this movie is". Negative criticism included the film's pace which The Arizona Republic described as being "far too episodic", while CNN.com described the film as "clunky and disjointed". Another criticism was that the many supporting characters did not get enough screen time. The film was listed at #36 on Entertainment Weekly's list of the 50 Best High School Movies praising Rowling for ingeniously blending "two literary traditions, fantasy and coming-through-school fiction". The film was nominated for the Academy Award for Best Art Direction at the 78th Academy Awards. At the 2006 Teen Choice Awards, the film won the award for Choice Movie Drama. The film won the BAFTA Award for Best Production Design, making it the first Harry Potter film to win at the BAFTAs. At the 2006 Kids' Choice Awards, the film won the Blimp Award for Favorite Movie, becoming the first and only Harry Potter film to do so. ↑ "Harry Potter and the Goblet of Fire (12A)". British Board of Film Classification. 17 October 2005. Retrieved 27 December 2015. 1 2 3 4 5 "Harry Potter and the Goblet of Fire (2005)". Box Office Mojo. Retrieved 5 February 2009. ↑ Susman, Gary (11 August 2003). "Ready, Aim, 'Fire'". Entertainment Weekly. Retrieved 12 October 2012. ↑ "Harry Potter at Leavesden". Warner Bros. Entertainment Inc. 2011. Retrieved 13 October 2012. ↑ Silverman, Stephen (5 August 2004). "Ralph Fiennes Ready to Scare Harry Potter". People Magazine. Retrieved 12 October 2012. ↑ ""Harry Potter and the Goblet of Fire" Production News". About.com. 25 June 2004. Retrieved 12 October 2012. ↑ "Harry Potter: The past and the future". NYTimes. 4 June 2004. Retrieved 12 October 2012. 1 2 3 "Harry Potter and the Goblet of Fire film production notes". The Cinematic Intelligence Agency. Retrieved 13 October 2012. ↑ Kennedy, Gerard (26 January 2012). "Tech Support Interview: Stuart Craig and Stephenie McMillan on a decade of designing 'Harry Potter'". HitFix.com. Retrieved 13 October 2012. ↑ "Filmtracks: Harry Potter and the Goblet of FIre (Patrick Doyle)". 18 November 2005. Retrieved 9 October 2012. ↑ Utichi, Joe (19 December 2007). "COMPOSER PATRICK DOYLE: THE RT INTERVIEW". Rotten Tomatoes. Retrieved 9 October 2012. ↑ Sung, Mark (21 October 2004). "Jarvis Cocker to write next Harry Potter soundtrack". Monsters and Critics. Retrieved 9 October 2012. ↑ Lewis, John (12 February 2016). "Jarvis Cocker on Pulp, Harry Potter and life in Paris". Uncut. Retrieved 8 September 2016. ↑ "UK rockers sip from Potter's 'Goblet'". The New Zealand Herald. 25 October 2005. Retrieved 9 October 2012. 1 2 Harry Potter: Behind the Magic. Grenada Television. 19 November 2005. 1 2 Dadds, Kimberly; Miriam Zendle (9 July 2007). "Harry Potter: books vs. films". Digital Spy. Retrieved 14 September 2007. ↑ Burr, Ty (17 November 2007). "Harry Potter and the Goblet of Fire Movie Review". The Boston Globe. Retrieved 15 September 2007. ↑ "Exclusive First Look at 'Harry Potter and the Goblet of Fire' to Be Presented During Network Television Debut of 'Harry Potter and the Chamber of Secrets,' Airing May 7 on ABC". Business Week. 2 May 2005. Retrieved 12 October 2012. ↑ "Potter four film trailer released". CBBC Newsround. 8 May 2005. Retrieved 12 October 2012. ↑ Pearson, Anthony (23 August 2005). "Harry Potter and the Goblet of Fire International Trailer!". Monsters and Critics. Retrieved 12 October 2012. ↑ Castaneda, Karl (12 April 2012). "EA Announces Harry Potter and the Goblet of Fire". Nintendo World Report. Retrieved 12 October 2012. ↑ Grossberg, Joshua (23 February 2005). "Toy Fair Feels the Force". E! News. Retrieved 12 October 2012. ↑ Barbara Vencheri; Sharon Eberson (18 November 2005). "A 'Goblet' full of Potter movie tie-ins". Pittsburgh Post-Gazette. p. C-5. Retrieved 14 October 2012. ↑ "Goblet of Fire Classification, Australia". Australian Classification Board. 9 November 2005. Retrieved 15 October 2012. ↑ "Winnipeg band's Harry Potter case dismissed". CTV.com. 5 November 2005. Retrieved 21 July 2009. ↑ Lambert, Steve (3 March 2008). "Wyrd Sisters still battling Potter". Toronto Star. Retrieved 21 July 2009. ↑ "'Wyrd Sisters' cannot stop Harry Potter". CBC. 4 November 2005. Archived from the original on 27 May 2007. ↑ "'Winnipeg folk band that took on Harry Potter ordered to pay $140,000 court costs". Canada.com National Post. ↑ Lambert, Steve (2010). "Wyrd five-year court battle over Harry Potter movie ends with secret settlement". Winnipeg: Canadian Press. Retrieved 8 November 2013. 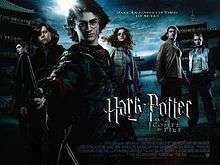 ↑ "Potter film to get Imax release". BBC News. 3 May 2005. Retrieved 15 October 2012. ↑ McCoy, Adrian (16 November 2005). "IMAX gains in popularity; 'Potter,' 'Express' due here". Post-Gazette. Retrieved 15 October 2012. ↑ ""Harry Potter and the Goblet of Fire" Gets an IMAX Release". About.com. 2 May 2005. Retrieved 15 October 2012. ↑ "'Harry Potter' cast attends London premiere". USA Today. 6 November 2005. Retrieved 15 October 2012. ↑ Briggs, Caroline (6 November 2005). "Potter premiere casts its spell". BBC News. Retrieved 15 October 2012. ↑ The World's #1 Harry Potter Site. Mugglenet.com. Retrieved 29 May 2007. ↑ Greg. "Harry Potter DVDs". Retrieved 3 October 2011. ↑ Goblet fastest selling DVD ever. News.BBC.co.uk. Retrieved 29 May 2007. ↑ 'GoF' DVD now a Guinness World Record holder. HPANA.com. Retrieved 29 May 2007. ↑ Brown, Kenneth (23 October 2010). "Harry Potter and the Goblet of Fire Blu-ray Review". Blu-ray.com. Retrieved 15 October 2012. ↑ Puig, Claudia (5 December 2008). "ABC Family peeks at ' Half-Blood Prince'". USA Today. Retrieved 17 October 2012. ↑ Joal Ryan (23 November 2009). "New Moon Makes a Lot of Money (But Not Quite Batman Money)". E! Online. Retrieved 24 November 2013. ↑ "Harry Potter and the Goblet of Fire Movie Reviews, Pictures". Rotten Tomatoes. Retrieved 14 October 2012. 1 2 "A blistering Goblet of Fire". New York Daily News. Archived from the original on 14 November 2006. Retrieved 10 June 2007. ↑ Zacharek, Stephanie (17 November 2005). "Harry Potter and the Goblet of Fire". Salon.com. Retrieved 10 June 2007. 1 2 3 McCarthy, Todd (9 November 2005). "Harry Potter and the Goblet of Fire". Variety. Retrieved 10 June 2007. ↑ Dargis, Manohla (7 February 2005). "The Young Wizard Puts Away Childish Things". The New York Times. Retrieved 10 June 2007. ↑ "Showtimes". The Washington Post. ↑ Morgenstern, Joe (18 November 2005). "As a Moody Johnny Cash, Phoenix Is on the Money In Masterful 'Walk the Line' ". The Wall Street Journal. ↑ Muller, Bill (18 November 2005). "Harry Potter and the Goblet of Fire". The Arizona Republic. Retrieved 10 June 2007. 1 2 Clinton, Paul (21 November 2005). "Review: New Potter tries to do too much". CNN.com. Retrieved 10 June 2007. ↑ "50 Best High School Movies". Entertainment Weekly. 22 September 2012. ↑ "The 78th Academy Awards (2006) Nominees and Winners". Academy of Motion Picture Arts and Sciences. Retrieved 11 October 2012. ↑ "Teen Choice Awards 2006 (List of Award Winners and Nominees)". Lucy Media. Retrieved 11 October 2012. ↑ "Bafta 2006: The winners". BBC News. 19 February 2006. Retrieved 11 October 2012. ↑ "Winners Release – Nickelodeon Kid's Choice Awards 2006". Nickelodeon Press Site. 1 April 2006. Retrieved 11 October 2012.